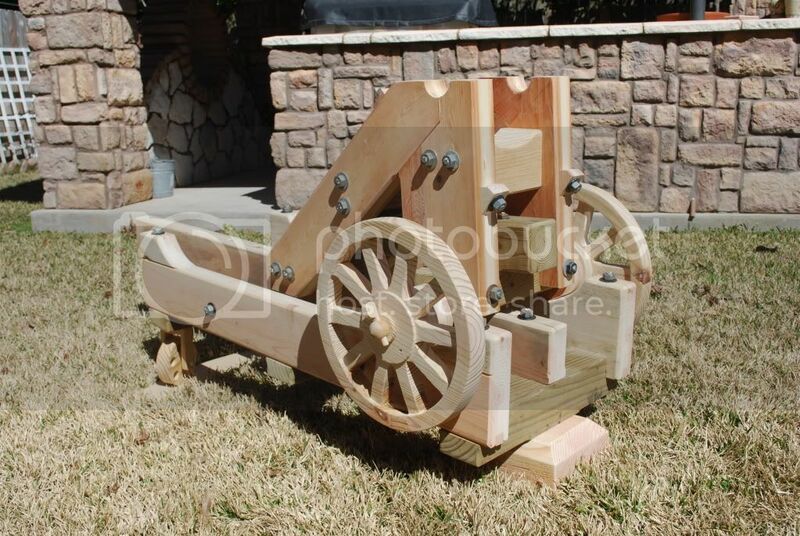 Here is the latest wooden cannon I built. 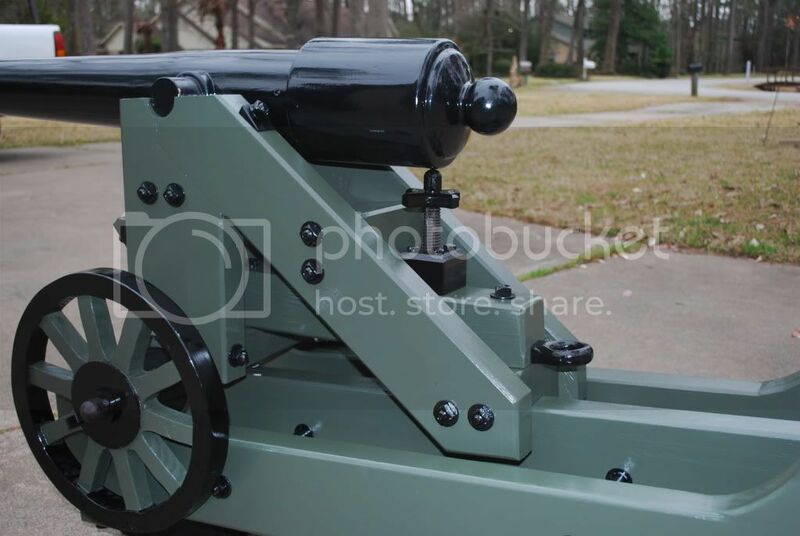 It is a 1/3 scale 100 pounder Parrott Rifle on a front pintle Barbette carriage. When the gun was fired, it recoiled uphill and was then swabbed out and reloaded. 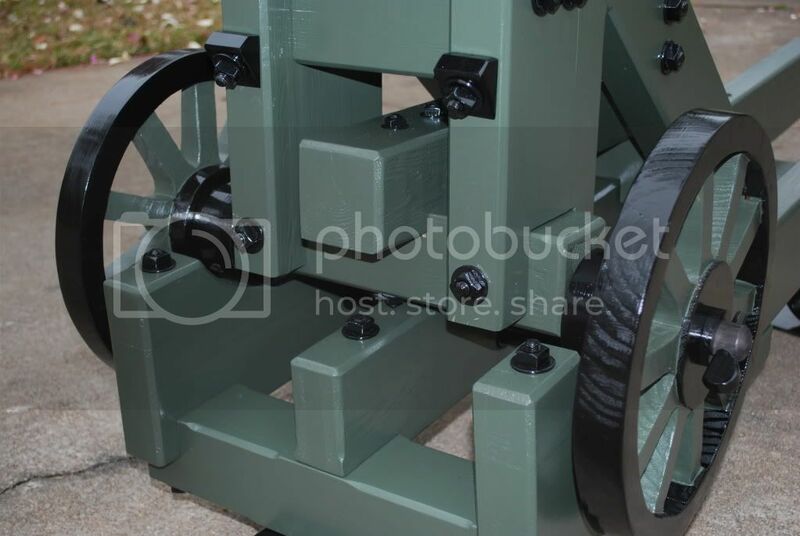 Then the wheels were turned to roll the gun back into firing position. 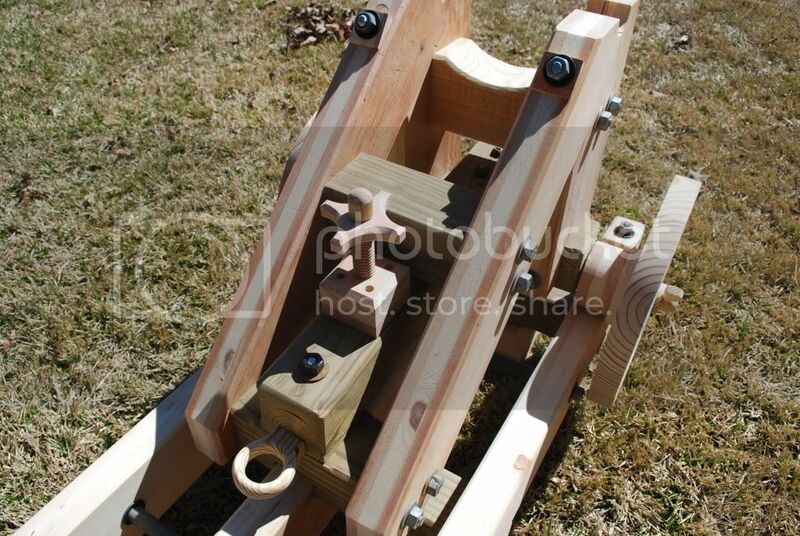 The little rear wheels ran on a track that was a 180 degree circle. The front of the gun pivoted on a pin. this is how you aimed it. That plus the threaded wood leveling screw. finished product looks like steel and Iron until the closeups show the grain. Nice work. 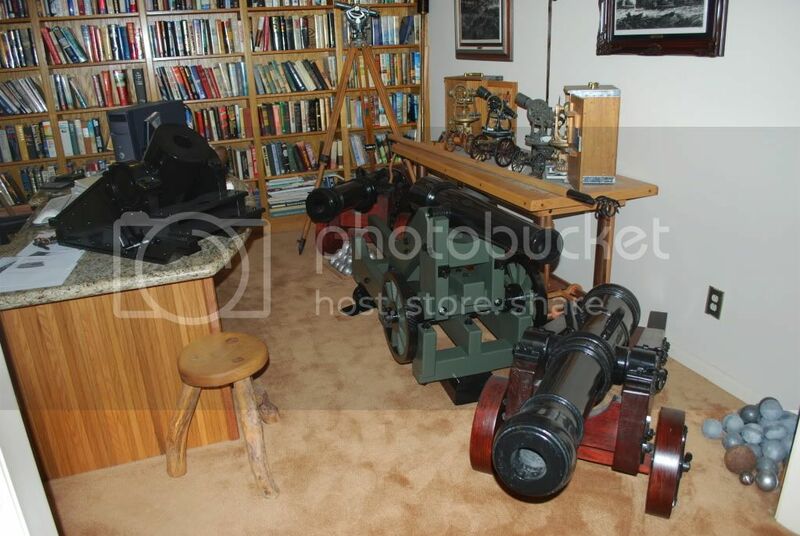 Those cannons are just to cool, do you ever worry about running out of room too display them. I have been out of room for a long time. The first picture is looking into my library and the second is looking into the foyer from my front door. Both rooms are adjoined so you see all this when you take two steps into the house. This is just part of the collection. If someone ever breaks into your house through the front door and stops to look around for two seconds to look around, they will be gone in three seconds!!!! All those guns look so very real and there are so meny of them that it would make an armory look like a nice try!! I would have to put most of them out side and then the neighbors would complain that their friends won't come to visit any longer! Seriously, NICE WORK!!! Not my cup of tea but, I do apreicate the work and skill (not to mention the reserch) that it takes to build such awsome items. Another beauty for sure. Looks lke you're ready to defend your castle. If I had rooms that full of guns, my wife would have a fit. Great collection. If you did not tell us were wood I would swear they were the real thing. Do you work from published plans? You are a king of painting! Superfinish! 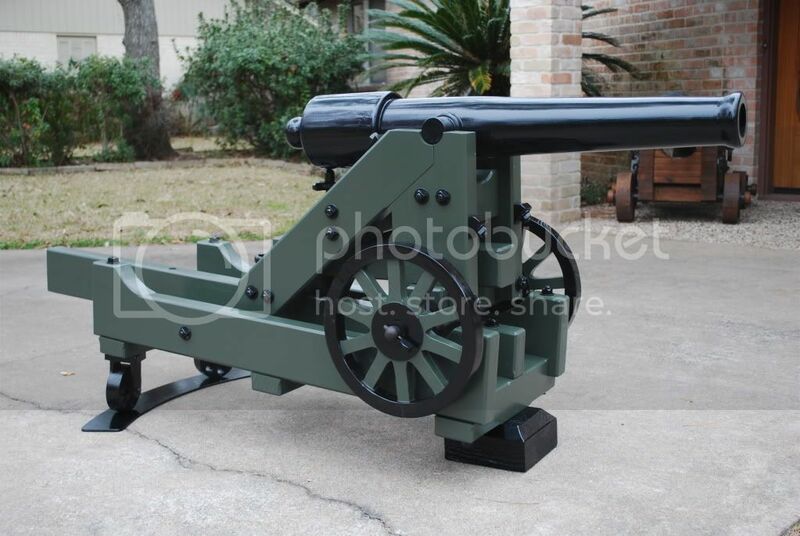 I really like the canons. No there are no plans. There are original pictures available and sometimes a drawing from the 1700 or 1800's. 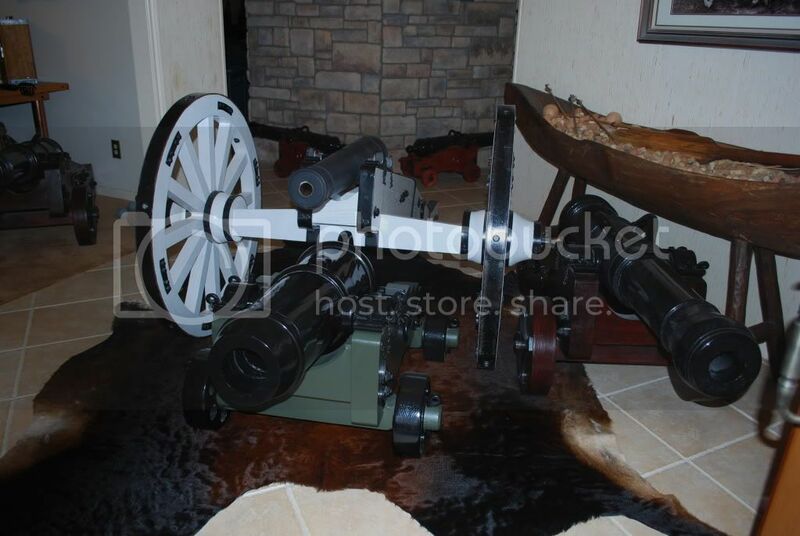 And certainly there are actual measurements of many dufferent guns and carriages available. They are very historically accurate. Zulu, those are great.....I'd love to have two of them on the front, topdeck, corners of my boathouse.......it'd make great jet-ski reppellent !!! Wonderfull work all the way around !!! Two could be yours. Its only money.